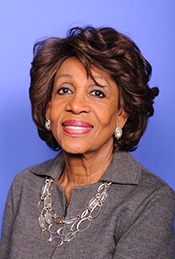 WATERS, Maxine, a Representative from California; born Maxine (Moore) Carr, in St. Louis, St. Louis County, Mo., August 15, 1938; B.A., California State University, Los Angeles, Calif., 1970; teacher; Head Start volunteer coordinator; Delegate, Democratic National Conventions, 1972-1988; member of the California state assembly, 1977-1991; elected as a Democrat to the One Hundred Second and to the fourteen succeeding Congresses (January 3, 1991-present); chair, Committee on Financial Services (One Hundred Sixteenth Congress). Papers: 1979-1990, 30 cubic feet. The records contain bill files for Maxine Waters from when she was a member of the California State Assembly. Papers: In Miscellaneous Office Files of Maxine Waters, 1978-1982, 11 cubic feet. The files contain schedules and itineraries, Ways and Means, budget conference and Elections and Reapportionment Committee working papers from Maxine Water's tenure as a member of the California State Assembly. Also included is Judiciary Committee correspondence on pending legislation. Papers: In Subject Files of Maxine Waters, 1977-1986, unknown amount of material. The files include documentation on the Commission on Status of Women. Restricted access. Oral History: In the Gloria Molina Interview, 1990, 531 pages. Subjects covered include Maxine Waters. Oral History: In the John E. Huerta Interview, 1990, 261 pages. Subjects covered include Maxine Waters. Oral History: 2001, amount unknown. An oral history interview of Maxine Waters conducted on July 29, 2001. "Maxine Waters" in Black Americans in Congress, 1870-2007. Prepared under the direction of the Committee on House Administration by the Office of History & Preservation, U. S. House of Representatives. Washington: Government Printing Office, 2008. "Maxine Waters" in Women in Congress, 1917-2006. Prepared under the direction of the Committee on House Administration by the Office of History & Preservation, U. S. House of Representatives. Washington: Government Printing Office, 2006. Naden, Corinne J. and Rose Blue. Heroes Don't Just Happen: Biographies of Overcoming Bias and Building Character in Politics. Maywood, N.J.: Peoples Pub. Group, 1997.